Robert Frank was born in Switzerland in 1924 and raised in a Jewish household in Zurich. He moved to New York in 1947. His photo essay, “The Americans,” resulted from a journey that he undertook by car in June 1955 during which he photographed the people and places that he encountered along the way. In fact, he took some twenty-seven thousand photographs which he eventually whittled down to the 83 images that were published in book-form in 1958. Frank’s book evoked strong reactions from many quarters at the time of its publication. He was even accused of being “unAmerican” – perhaps due to the critical commentary on contemporary urban life in America that was delivered by his stark black & white imagery. In this photo entitled “U.S. 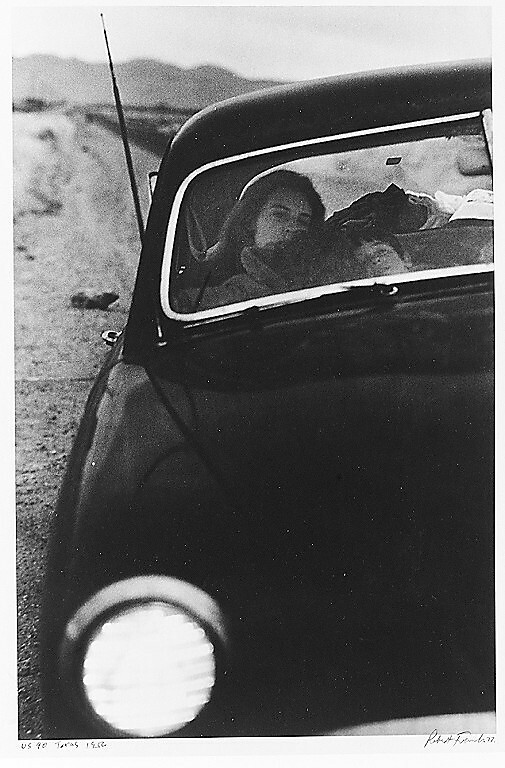 90, en route to Del Rio, Texas”, Robert Frank photographed his wife, Mary, snuggled up to one of the children during their drive west on highway 90 towards Los Angeles. It’s winter and Christmas is rapidly approaching. Mary looks tired and despite being inside the car, she is dressed warmly enough to be outside. It must be very cold. Is that snow by the roadside? The jet-black hood of their Ford reflects the surrounding scene and brings to mind that famous quote of Henry Ford: “Any customer can have a car painted any colour that he wants so long as it is black”. The Ford provides stark contrast to this wintery, roadside scene. The car seems to represent a haven; a cocoon sheltering the family during their lonely journey across country. Robert has chosen to crop this picture in such a way as to draw the viewer’s eye to the front occupants of the Ford. The sectioning of the car in this manner and the long view down the right fender towards the interior – emphasised by the relatively shallow depth of field – is both curious and unsettling. The viewer struggles to make sense of this scene. Robert is neither emphasising the lines or proportions of the Ford nor does he divulge anything significant about the surrounding landscape – except perhaps of the highway behind, extending arrow-straight and disappearing into the far distance. One imagines the road ahead as being equally straight with a long, long way to travel. The illuminated car headlight gives witness that the car is probably idling during their stop, providing a comforting burble and grumble to the occupants. One wonders why they pulled over to the highway shoulder en route. The car seems to be at a slight incline – greater than the highway gravel shoulder – and at odds with the horizon. Flat tire? The viewer is thus left to consider Mary’s situation. What is she thinking and feeling during this long and arduous journey? What have she and Robert spoken about? Laughed about? Argued about? When will he finally come home to be with her and the children? Indeed, there is a Ford in this image. And a highway. But this photograph is about Mary. Image source: The Metropolitan Museum of Art (accessed on February 20, 2012). This entry was posted in Essays and tagged Robert Frank, The Americans, US 90. Bookmark the permalink.